The event known as The Anarchy is one of the least known periods of English history but also one of the most interesting. This English civil war has its origins on the fateful night of 25th November 1120, when the White Ship sank in the English Channel off the Normandy coast after its port side struck a submerged rock, killing King Henry I of England's only legitimate son, William Adelin, who was heir to the Throne. The cause of the ship's sinking remains uncertain, but there are stories that its crew and passengers binge drank. In those days there were no set rules of succession, so after the sinking there was no heir. But, in 1127, Henry made his daughter Matilda the heir to the Throne. But when Henry died in 1135, Henry's nephew, and Matilda's cousin, Stephen had himself crowned king. After all, Matilda was an unfavourable choice for the Crown, partly because she was a woman. But Matilda so desperately craved the Crown which she believed was rightfully hers, and decided to fight Stephen for it, and she became Queen briefly - she was England's first female ruler. And so began the war for the leadership of England. Let's take a tour of eight places associated with this dispute. Stephen had himself crowned king in December 1135 following the death of his uncle Henry I, despite the fact that Henry had chosen his daughter Matilda as his heir. Queen Matilda, King Henry I's daughter and Stephen's cousin, reigned from April to November 1141. In November, Stephen again took to the Throne. She was England's first female ruler. This little-known power struggle between competing claimants to the throne had consequences that reverberated through history. We visit eight places associated with the dispute. The Anglo-Saxon Chronicle recalls the 19-year reign of King Stephen as an era “when Christ and his saints were asleep”. Later authors referred to it as “the anarchy”. Nowadays historians prefer to describe it as a civil war or a war of succession. Undoubtedly it was a time where the throne was hotly contested, with several different candidates asserting their claims to be the ruler of England. Disputed successions were nothing new in England. In the years after the Norman Conquest there were no set laws to decide who should replace a deceased monarch. However in most cases the boldest claimant had been able to muscle their way to supremacy within a relatively short period. Not so with Stephen. 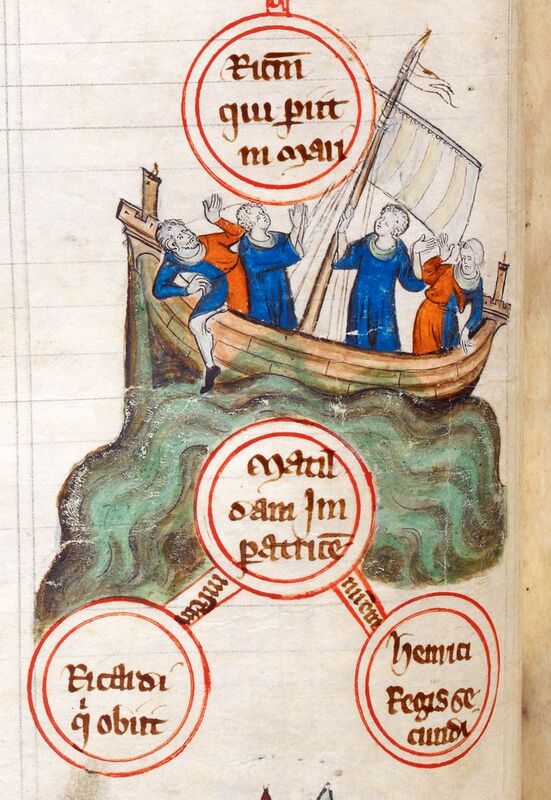 The problems began in 1120 when a ship - the White Ship - carrying Henry I’s only legitimate son (William Adelin) sank on a trip back from Normandy. With the most likely successor to Henry dead, it became very unclear who would accede after his own passing. Henry nominated his daughter Matilda as heir in 1127 but she was never a popular choice, partly because she was a woman and also for the fact that her husband, Geoffrey of Anjou, had fallen out with Henry over her rights in Normandy. Henry’s nephew, Stephen of Blois, felt that he had a good claim to the throne. When Henry died (probably from dysentery) in 1135, Stephen moved quickly, securing popular approval for his accession and having himself crowned in December of that year. As a pious man and courageous soldier, Stephen had much to recommend him but unfortunately he was politically naive, and lost the support of several leading churchmen and nobles, including the powerful figure of Robert, Earl of Gloucester – Henry I’s illegitimate son. To compound his woes, David, King of the Scots, was frequently harassing parts of northern England. Sensing her opportunity, Matilda landed in Sussex in 1139, seeking to wrest the crown from Stephen, who she viewed as an unlawful usurper. Together with Robert of Gloucester she led a military campaign against Stephen that culminated in his defeat and capture at the battle of Lincoln in February 1141. That might have been the end of the story, but Matilda herself proved to be an incompetent ruler, acting in a haughty fashion that alienated her from the people she desired as her subjects. Stephen’s queen (also Matilda) took up arms against her namesake and managed to capture Robert of Gloucester seven months later. The resulting prisoner exchange saw Stephen freed to resume his place on the throne of England. At this point, something of a stalemate ensued. Stephen cemented his position in the south-east of England, while Matilda, with Robert’s aid, dominated the south-west and neither was strong enough to remove their rival from contention. There was military activity but no decisive breakthroughs. The stalemate was broken in October 1147 with the death of Robert, Earl of Gloucester. Losing her key supporter weakened Matilda’s position significantly and she herself left England for Normandy in the spring of 1148. However Stephen was in little position to rejoice because he faced a new challenge in the form of Matilda’s son Henry, who made several expeditions to England, intending to succeed where his mother had not. The wars seemed destined to continue and so at this point the aristocracy intervened. Sick of the lack of an effective monarch, they refused to take up arms against each other and compelled Stephen and Henry to come to an arrangement in November 1153. The compromise was that Stephen would retain the crown but be succeeded by Henry on his death. In the event, Henry did not have long to wait. Stephen died in October 1154, leaving Henry to rule for the next 35 years. After Matilda's campaign against Stephen failed, her son Henry then decided to fight Stephen for the Crown. A compromise was reached, whereupon Henry became King Henry II after Stephen's death. He was the father of King Richard I (Richard the Lionheart). “Stephen’s reign is one of the most significant in English history,” says Professor David Crouch of the University of Hull. “The consequences of it were enormous and very long term.” With a weak, embattled king on the throne the aristocracy took the opportunity to cement their own positions and in the end combined to set the agenda for Stephen and Henry. By these actions they became important partners in the governance of England, leading to a baronial reform movement that resulted in Magna Carta (1215), and the development of parliament to further the baronial agenda. One thing that did not emerge from the civil war was a recognised line of succession. Disputes about the line of the throne would re-occur for centuries and it was not until the Tudor period that Acts of Succession and parliamentary legislation set down in writing exactly who should wear the crown. Henry I’s only legitimate daughter was Matilda, born in 1102. She acquired the title of empress through her marriage to the Holy Roman Emperor, Heinrich V, in 1114. Heinrich died in 1125 and she married her second husband Geoffrey of Anjou three years later. Meanwhile Henry had designated Matilda his heir in the presence of several notables, including his nephew Stephen of Blois. But when Henry died in 1135, probably from dysentery, Stephen reneged on his oath and seized the crown. Accepted by the majority of the English establishment, he was too secure for Matilda to consider asserting a challenge from her base in France. In time though Stephen’s political ineptitude meant he antagonised many leading noblemen, notably Matilda’s half-brother Robert of Gloucester. Magnates began rising against Stephen, compelling him to use military force to assert his authority. This was the background to Matilda’s landing in England, accompanied by Robert of Gloucester on 30 September 1139. She was invited to stay at Arundel Castle where her stepmother Queen Adeliza (who was Queen consort between 1121 and 1135 during her marriage to Henry) was living with her new husband, William d’Albini. Confusingly, d’Albini was loyal to Stephen, prompting speculation that Adeliza had hoped to broker some kind of peace deal between the king and her stepdaughter. Robert of Gloucester swiftly departed to his Bristol stronghold, leaving Matilda at Arundel. Stephen marched on the castle where he encountered no resistance from the earl and his wife, who opted to avoid confrontation. With Matilda at his mercy Stephen dithered. As she had not yet come out as an enemy he felt unable to imprison her and so decided to allow her safe passage to the west of England where she could team up with Robert. At least this way, it was reasoned, the king’s enemies were all in the same place. When Matilda visited, Arundel Castle was a relatively recent construct. It had come into being shortly after the Norman Conquest and the stone keep was a 12th-century addition. The castle is now a popular tourist attraction, surrounded by lavish gardens. 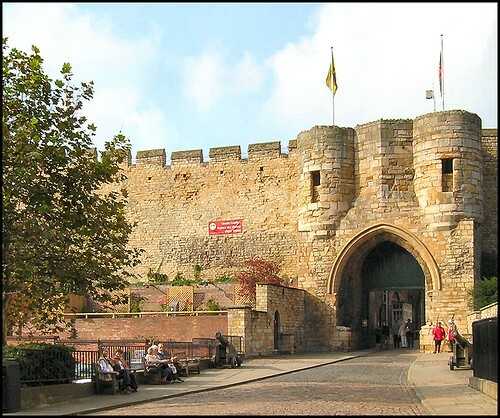 Lincoln Castle is another early-Norman creation, dating back to 1068. In late 1140 it was held by Ranulf, Earl of Chester. He had managed to offend the townspeople with his behaviour to the extent that complaints reached Stephen, who headed for Lincoln and commenced a siege. Unfortunately for Stephen, Ranulf’s father-in-law was Robert of Gloucester, who appeared on the scene with an army that contained, according to a contemporary source, “a dreadful and unendurable number of Welsh”. In the battle that followed on 2 February 1141 Stephen’s forces were overwhelmed. The king seems to have been outnumbered and the Welsh soldiers scared off his cavalry. Thinking the day was lost, many of the mounted troops fled, leaving Stephen to fight bravely on. He was eventually brought down by a rock to the back of the helmet and captured. The seizure of the king by Robert, Earl of Gloucester turned a minor dispute into a major event. Matilda suddenly found herself in a strong position to seize the throne. With Stephen in leg irons in Bristol, Matilda sought to become the new ruler. She secured church backing at a legatine council on 7 April 1141 and then prepared to have herself made queen. A coronation was planned at Westminster Abbey. Yet Matilda was far from universally accepted. She enjoyed strong allegiance from the west of England, but elsewhere the figures that mattered were often hesitant in their support, or even openly opposed to her. The Archbishop of Canterbury and the pope refused to recognise her as Stephen’s replacement. In a precarious position, Matilda does not appear to have helped her cause. Having been an empress from her youth she seems to have had an exalted view of herself, which could often be interpreted as arrogance. Like Stephen, she lacked the necessary people skills to reach out to those whose approval she required. Her attempt to have herself crowned that June ended in disaster. Stephen’s wife, Matilda of Boulogne, had raised an army, which arrived at the Thames and threatened the city of London. Not only that but the people of London had themselves risen up in opposition to the empress, who had displeased them with the imposition of taxes and the favouritism she showed to her West Country followers. Before the coronation could take place, Londoners stormed out of the city to attack Westminster, compelling Matilda to flee, her plans in disarray. Legend has it that the land around Westminster Abbey’s current site has been a place of worship since the Saxon king, Saberht, built a church here in c600 AD. The current Gothic abbey was constructed by Henry III in the 1240s, though the western towers weren’t added until c1745. Since William I (the Conqueror), all but two (Edward V and Edward VIII, who didn't have coronations) English/British sovereigns have been crowned here. Stephen’s brother Henry of Blois held the influential post of bishop of Winchester. In spite of family loyalties, on hearing of Stephen’s capture he agreed to come over to Matilda’s side. Nonetheless he was clearly not wholly convinced by the empress and after persuasion from Stephen’s wife Matilda he chose to throw in his lot with her. In response to Henry’s defection, the Empress Matilda marched on Winchester. Here she was met by an army led by the other Matilda, alongside William of Ypres and a band of Flemish mercenaries. This time the battle went against the empress. She managed to flee the defeat but her key ally Robert of Gloucester was captured on 14 September. 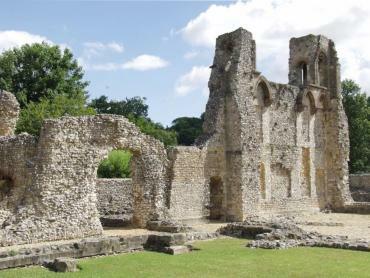 The story of the fighting in Winchester is somewhat unclear but Wolvesey Castle, then the bishop’s palace, was involved. The ruins that remain nowadays are largely the result of building work that was undertaken by Henry of Blois in the 12th century. Now ruined, Ludgershall Castle was a late 11th-century creation. It was taken into royal control around the start of the 12th century and was then enhanced by King John a hundred years later. Ludgershall was frequently used as a hunting retreat but eventually fell into disrepair. The castle was dismantled in the Tudor period. After the catastrophe in Winchester, Ludgershall was where the empress arrived on her way back to her heartland in the west of England. On her journey back Matilda was so exhausted that she had to be carried on a litter, sparking the legend that she travelled in a coffin. The loss of Robert was a major blow to Matilda’s cause, and negotiations soon began for his release, resulting in a swap deal whereby the Earl of Gloucester and King Stephen were both freed. There was, however, no peace deal and the two opponents were free to continue their enmity as before. Stephen was buoyed by his release and set about solidifying his reign. A church council in December 1141 accepted him as king again, but he was still unable to dominate his kingdom as he desired. Stephen felt compelled to continue his campaigns, beginning in Yorkshire in 1142 with a mission to bring a couple of troublesome earls to order. The biggest obstacle to his supremacy, however, remained Matilda in the south west. In the autumn of 1142 she was vulnerable. The empress’s husband had refused to aid her cause due to his commitments in Normandy and to compound matters Robert of Gloucester had temporarily departed for the continent. Stephen took the opportunity to besiege Oxford Castle, where Matilda was then based. Without Robert’s forces, the garrison at Oxford was on the verge of surrender. Then, in December, one of the most dramatic incidents in this civil war occurred. Matilda, realising that the game was up, snuck away from the castle with a small group of knights. Dressed in white, to blend in with the winter snow, they made it across the frozen Thames and sped away to safety. Shortly afterwards the garrison gave in, but the main prize had eluded Stephen. As with many of the fortresses dotted around the country in the mid-12th century, Oxford Castle had been created at the dawn of the Norman Conquest. It spent much of its life as a prison, only abandoning this role in 1996. A recent redevelopment has seen Oxford Castle repositioned as a hub for restaurants, alongside heritage attractions. After her escape from Oxford, Matilda made for Devizes in Wiltshire. Here she elected to stay. The robust stone castle in the town had been under the control of the bishop of Salisbury rather than Robert of Gloucester, so she was able to exert her own authority there. Entrenched in Devizes, Matilda was strong enough to control much of the West Country and parts of Wales. In these areas she issued charters and minted her own coins. She had, however, little chance of dislodging Stephen and any slim hopes she may have entertained evaporated with the death of Robert of Gloucester in 1147. The following year Matilda returned to France, where she lived out the rest of her days. The castle where Matilda resided in Devizes no longer stands, having been replaced by a 19th-century model. 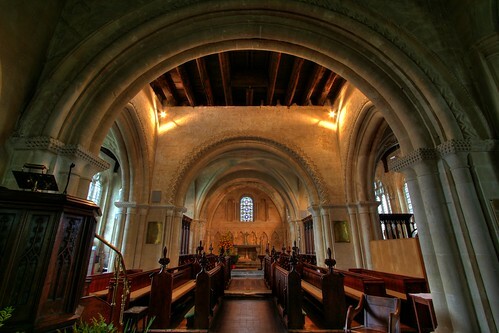 However its former chapel, built in 1130, does still remain as the Church of St John the Baptist. It still has its original sanctuary, chancel and crossing and is widely praised as one of the finest Norman churches in the region. Matilda might have gone but Stephen was not to be allowed much peace. The empress’s young son Henry aspired to the throne of England and made two expeditions to the country, in 1147 and 1149. On the second of these, Henry formed an alliance with his great-uncle, King David of Scotland. Together they attempted to invade the north of England but their plan was scuppered by the swift arrival of Stephen’s forces. Stephen had his own plans for the English crown in the shape of his son Eustace, who he hoped would succeed him. However, such a move offered little prospect of appeasing the supporters of Matilda and Henry or ending the civil strife. England’s magnates had long grown weary of the constant fighting and by the late 1140s were already negotiating with each other to find a means of resolving the dispute. One proposed solution was to allow Stephen to continue as king for his lifetime but to install Henry as his heir. After an interlude, when he was occupied in France, Henry reappeared in England in 1153. His troops met those of Stephen’s at Malmesbury. There, in foul weather, the king’s attack was aborted, while in the background the voices calling for a treaty were growing in strength. That August the foes met once more at Wallingford Castle, where Stephen’s men had been closing in on a former stronghold of Matilda’s. This time the two armies refused to fight and Stephen and Henry began to contemplate a deal. The situation was greatly simplified by the untimely death of Eustace that summer, removing a key obstacle to Henry’s succession. An agreement was reached in Winchester towards the end of the year, that saw Stephen free to continue his reign untroubled but with Henry adopted as his heir. The king does not appear to have been too displeased with the situation and was often seen with Henry at his side in subsequent months. Sadly he did not have long to enjoy this newfound harmony, for in October 1154 he was taken ill and died in Dover Priory, leaving the way clear for Henry II. Wallingford Castle, built in around 1067, continued to be in use until the 16th century. It fell into partial decay but was then refortified and held by the Royalists in the Civil War. After the Parliamentarian victory it was demolished under Cromwell’s orders in 1652. Now peaceful ruins remain. Last edited by Blackleaf; Feb 21st, 2010 at 12:30 PM..